Tijuana is a border town. That means it straddles two different worlds. Its heart beats red, white, and green, but its identify runs deeper than that. Tijuana is nebulous. It shares a border with San Diego, and because of this it is the most visited border city on the planet. Influences from the north, south, east, and west make their way here, bringing from their homelands with them. Monkeys. The Players of Tijuana drive through Zona Centro in classic rides that range from a 70’s charger to a Ford model A. This is a diverse city, and they all filter through the Chino Barbershop. When we brought Don Juan to the world famous Chino Barbershop in Tijuana, we didn’t know what we were in for. It didn’t take long for us to realize that even in a city as varied as Tijuana, the barbershop was a place where people came together. Business men in collared shirts and vests sat beside young men wearing shorts and t-shirts, both getting their hair cut and beards trimmed by tattooed barbers in their twenties. Age didn’t matter at the Chino Barbershop. Lifestyle didn’t matter at the Chino Barbershop. Everyone was there for the same reason, to get a great cut and shave from a shop that knows how to work with their style. We knew this was the perfect testing ground for Don Juan, and had some cold ones with the locals while Chino’s barbers tried out our products. We knew our products captured the spirit of Chino’s—style that never dies, independent of age, demographic, job, class and attire. Chino’s clients knew quality when they experienced it. From our pomade to our beard oils and soaps, our scents, hold, and message resonated in the shop. We believe you shouldn’t compromise your style for anyone, and your supreme men’s grooming products shouldn’t either. 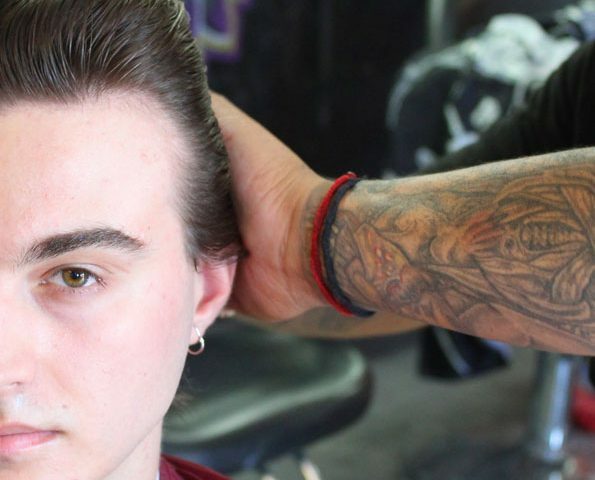 Barbers and clients alike took to Don Juan. With just the right amount of hold for any application, and subtle scents that make a statement without overpowering the conversation, Don Juan and Chino’s barbershop shared the same vision. Watching the barbers masterfully trim, shear, and cross-fade left us in awe. It was like seeing a great master at work. They didn’t work alone though. The clients helped direct the symphony, and the barbers brought it to life. Don Juan was a vital instrument in the process, shaping the perfect cut into a unique style that matched the client’s vision. We’re already planning our next trip to Tijuana. Everlasting style comes from the soul and just like Don Juan, at Chino’s Barbershop, style never dies.